I posted a selfie of this outfit on Instagram over the holidays and low and behold a super HUGE fashion blogger posted an almost identical look on her blog the very same day. It was none other than J's Everyday Fashion. Find her personal style of this look here . I was pretty pumped because this girl knows her stuff. Her style and budget are very similar to mine She is seriously who I dream of becoming in the blog world. I mean, she's splattered all over Pinterest. J, if you're reading, which I am sure you're not, you and me, well, we have some fashion blogger ESP goin' on. Let's keep it that way, okay? On another note, this week is dedicated to animals. Animals on clothes that is. Wednesday was elephants. Thursday was a cute little owl. Today it's a foxy good time. Nope, it was not planned in the blogging cards. It just magically happened. So, any of you ladies digging animal on fabric? Well, besides the trusty ol' leopard? Love the sweater. I like how u paired it with a polka dot button up. I'm also loving your boots with knee socks. Ok, that fox sweater is the cutest thing! wow! who woulda thunk foxies AND polka dots?! that's great haha! Great minds think alike! 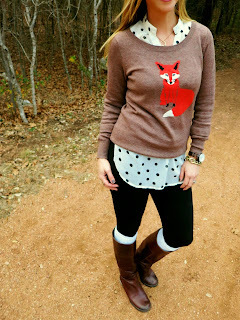 Super cute sweater and I love the layered polka dots! I've been obsessed with getting a fox sweater since I saw it a youtube video. It looks great with the leggings. I'm going to kohls for socks tmrw. I've been scared to try leggings with boots bc I don't have the boot socks. Fashion Problems! 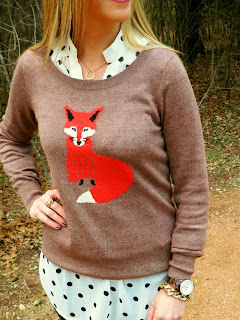 Eeeek your jumper is so cute.I should invest in animal jumpers ;) Happy Friday..
Umm, I have never loved a fox more. I want that sweater! Love it paired with the polka dots and pants tucked into boots! So. Cute. I absolutely adore this outfit. You always put together the cutest clothes. Nothing aside from leopard for me. she should be reading you!!! since you are my fave fashion girl! So cute paired with the polka dot blouse underneath! Happy Friday, Shanna! YOU are going to be a huge fashion blogger, girl... you already are!! Little miss model! I love the fox sweater. I searched high and low for this sweater over the holidays and to no avail! I love it !!! P.S. You're rocking the whole look - and you've encouraged me to put my polka dots with some different looks. 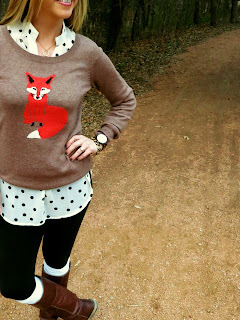 That fox sweater is so cute & I love it on top of the Polka Dot Blouse. I wish I was in USA now. =( I would purchase some cute sweaters from Old Navy, like this. Wishing you a Fab Weekend!! You are well on your way to becoming her in the blog world! To me (and many others) you already are!! :) And YES to animals everywhere!! I love this sweater - your version is equally as adorable as J's version. How fun that it happened on the same day! That's really cool. And I think you're definitely going to hit her kind of status. Your budget and style is so approachable for everyone! That's so awesome! I love this look too. The sweater is so cute and I love the blouse under it. you're too cute. Love this sweater.. I am a fan of animals on your clothes but I think the closest thing is my animal print scarves or a cardigan..
Look at you!! I love it! I personally am in heart with the boots and boot socks, you nailed this look! I love the animals-especially the fox. Doesn't an animal print seem to make your days better? No..just me? There you are again in that cute fox sweater! Kudos on your amazing fashion sense! Your posts always bring a smile to my face. Happy New Year, Shanna! LOVE that sweater! Said this the last time you wore it, but so sad I didn't catch it when it was in stock! Also love that you and your daughter have similar animal sweaters - adorable! 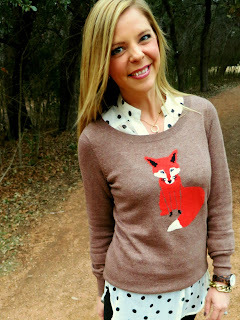 i LOVE my fox sweater, too! my son has one from target and he asks to match me sometimes. adorable!!! so glad that ON had such an affordable version for us to enjoy! Love the sweater! I like both your version and J's version, but I do prefer your photos as they are more personal! I love it! And your daughter is so precious, they both are! I totally saw J's outfit after I saw your pic on Instagram and I did a double take! How cool that you guys came up with almost identical looks!! OMG! I want that sweater!!! You guys are twins! So cute! I don't own an animal print sweater. Don't know if I could pull it off but it looks great on you! Yes I love animals on sweaters! Wish I would have bought the J Crew French Hen a while back!! I actually wore this sweater today to work! I LOVE how you layered it with the polka dot shirt - SO cute. Love your style, Shanna!! I also should have snatched this up at Old Navy. Your sassy little mini-me is so cute! Too adorable that she came up with all of those poses on her own! We are on day 4 and nothing ugly yet... I am waiting! Until the I love you. I love the animal theme keep it up! That's such a cute outfit!I bought the owl sweater, and I love it. I love the polka dots...I'd never have thought to put those together! You and J do have similar style :) I'm loving animal sweaters at the moment! yes! you and j totally have similar styles. LOVE this outfit! and i love the animal trend. so cute and fun! That is so funny and cool! Shes wearing the exact same thing! Wow, great outfit, you look georgeous! I especially love the sweater!